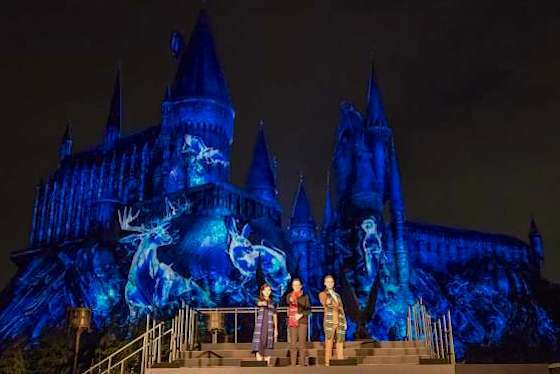 The Osaka park unveiled its revamped Harry Potter ride on Thursday, making this the first of the two existing Hogwarts Castle rides to play in 3D. The original Harry Potter and the Forbidden Journey, at The Wizarding World of Harry Potter – Hogsmeade in Universal's Islands of Adventure in Orlando, remains in its original, 2D projection form. Harry Potter film series actors Tom Felton (Draco Malfoy), right, and Katie Leung (Cho Chang) were on hand with park president Glenn Gumpel for a ceremony Wednesday night at the Osaka park to “enchant” the Hogwarts Castle with a special spell to make the attraction run in 3D. The Wizarding World of Harry Potter opened at Universal Studios Japan last summer, drawing record crowds to the park, which is Universal's most popular by annual attendance, drawing more than 11 million visitors a year. Will the 3D version of the Forbidden Journey come to one of Universal's American parks? Might this be one of the announcements that Universal Studios Hollywood will make as part of its Wizarding World of Harry Potter reveal on June 2? Stay tuned.